Kilimanjaro National Park is home to the highest mountain in Africa and the highest free standing mountain in the world. Mount Kilimanjaro is made up of three volcanoes, Shira in the west (4,269 m) Mawenzi in the east (5,280 m) and the youngest volcano Kibo (5,895m). Shira and Mawenzi are extinct and the last major eruption of Kibo was between 150,000 and 200,000 years ago. Today Kibo is dormant but could awaken any day. The vegetation on the mountain is also very varied and some 2,500 species of plants are found here including the endemic and beautiful red and yellow impatiens kilimanjari as well as the colorful violet viola. The lower regions of the park are dominated by lush green montane forests with almost 140 species of trees. A bit higher up, distinctive giant lobelias grace the moorland zone. Above 4,000 m one finds the moonlike desert, where not much grows and the land is full of rocks and dust. Closer to the summit, hikers will be rewarded with beautiful sights of glaciers and a deep crater. Out of the approximately 140 mammal species that live in the park, 87 of them are forest species. Animals that roam here include elephants, leopards, buffaloes, varies antelopes including the rare and endangered abbot duiker as well as primates such as the colobus and the mitis monkey. In addition hereto, 24 species of bats and 179 highland bird species have also been spotted in the Kilimanjaro National Park. The majority of visitors to the park are hikers. As is to be expected, all have the same goal in mind – to make it to Africa’s highest peak. There are seven official routes to choose from with Marangu being one of the easiest routes for unexperienced hikers and those in search for a bit more comfort (overnights take place in huts). 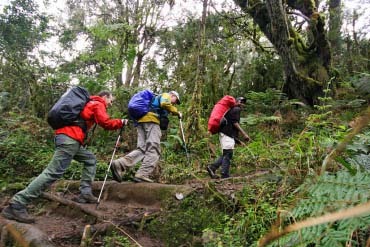 The Rongai route is the quietest route and the best choice if you are climbing in the rainy season as this part of the mountain gets the least precipitation. 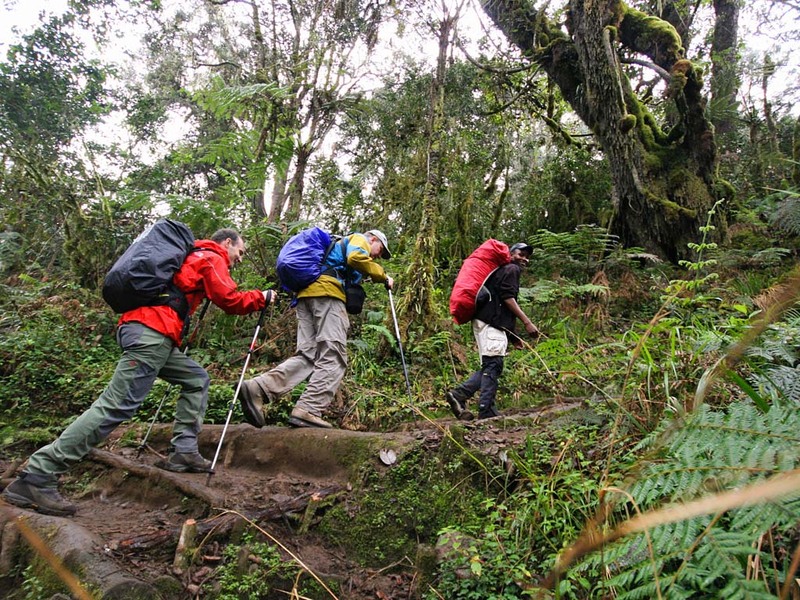 Camping routes include Lemosho, Shira and Machame and all are a bit more challenging but also much more scenic. The most demanding but also the least used route is Umbwe. Apart from Marangu and Rongai all other routes descend on the Mweka route.